I bet you didn’t know that brain cancer is the biggest killer of people under 40 in Australia. I had no idea either until I received an email from Ricky Anderson who had lost his incredible wife at the hands of this disease. As promised attached is a pic of Murphy in his shoes. He breezed through the 210km we walked over the 8 days from Sat 4th June to Sat 11th June and I’m sure could’ve walked back too! His boots you donated saved his poor feet from almost certain injury as there was so much glass on our travels. The day we left we had to contend with gale force winds and torrential rain for approx 30km….it was horrible! Day 2 was better as the rain had stopped but we had to wade through flooded closed roads to reach our destination (Murphy had to swim). 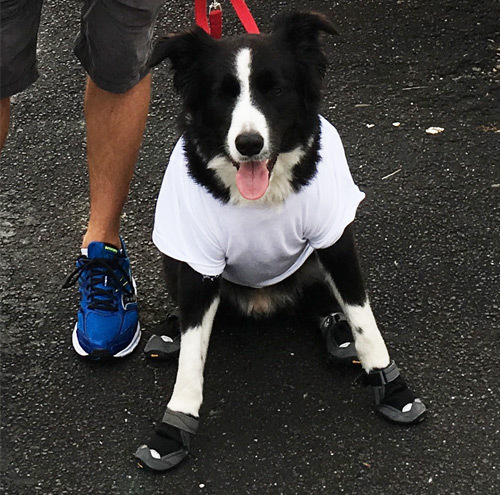 I would highly recommend the brilliant boots you donated which also drew a mass of attention to Murphy and our cause in honouring my beautiful wife (Murphys mum) Elisa. Any donations would also be greatly appreciated. Ricky is continuing the #bigthingsforbraincancer campaign he and his wife created before she sadly passed away from brain cancer. You can help too by donating to this cause and spreading the word that brain cancer research needs more funding. All the very best to your pack from ours! June 27, 2016 | Filed under Inspiration, Uncategorized.